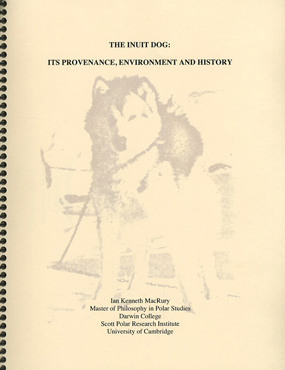 The Inuit Dog: Its Provenance, Environment and History by Canadian Ian Kenneth MacRury was written in 1991 as part of the requirement for completion of his Master of Philosophy in Polar Studies degree from Darwin College, the Scott Polar Research Institute (SPRI), University of Cambridge, United Kingdom. It remains the most comprehensive and sought after scientific publication written about the aboriginal Inuit Dog, Canis familiaris borealis. The Inuit Dog: Its Provenance, Environment and History covers the prehistoric origins of the Inuit Sled Dog and the environment in which the breed evolved. It explains how the Inuit Dog proved to be essential to the survival of arctic people for four thousand years, well into the mid-twentieth century. This publication examines physical characteristics including the wolf versus dog controversy, historical trends in height and weight, coat color patterns, and the breed's unique behavior and nutritional requirements. It includes sections on the history of the different systems of Inuit Dog use in early exploration and scientific endeavor at both poles as well as the current operation by the Danish government’s Sirius Patrol in North-East Greenland. It presents a wealth of information in the form of many tables and figures, as well as thirty-four bibliography entries and a list of one hundred thirty-eight references. This printing includes nine plates, four in full color. 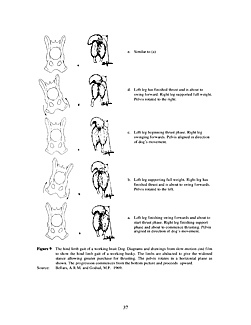 The Inuit Dog: Its Provenance, Environment and History is privately published by The Fan Hitch, Website and Journal of the Inuit Sled Dog. Professionally printed and spiral bound for easy page turning, it is 8.5 inches x 11.0 inches and seventy pages long. • The single copy price is $20.00 USD. • Since postage rates are beyond our control and subject to change without notice, please contact us for up-to-date fees. • Contact us at: mail@thefanhitch.org. • Checks or money orders, payable in U.S. dollars, made out to "Sue Hamilton".